1.The Jeita Grotto a system of two separate, interconnected caves, making up the longest explored cave in Lebanon. 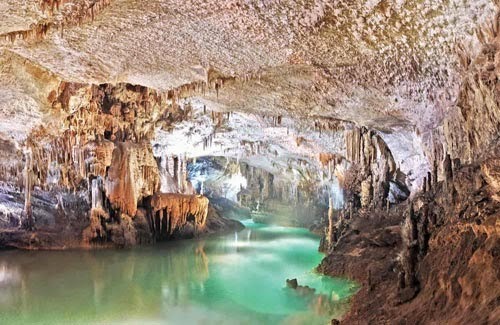 Just outside of Beirut, these underground limestone caves attract thousands of visitors with their vivid colors and stalactite formations. One of the world’s largest stalactites, which stands at 26.9 ft., is here. An access tunnel and a series of walkways have been built to allow tourists to safely walk without disturbing the natural landscape. 2.The Darvaza gas crater, known as “The Door to Hell,” is a 196 feet wide and 65 feet deep hole in the Karakum desert in Turkmenistan. The fire, fueled by natural gas, has been burning for the last 38 years, not by a natural occurrence, but instead, as a result of a Soviet gas exploration accident. Geologists accidentally tapped into a massive underground natural gas cavern, causing the ground to collapse and the entire drilling rig to fall in. In order to protect the locals and prevent intoxication from poisonous gas, the geologists decided it best to light the gas on fire and burn it away. On a dark night, you can see the burning hole from miles away. 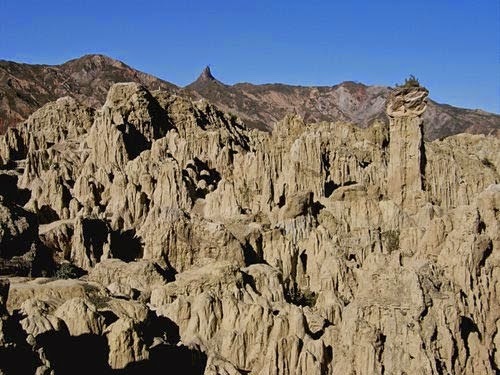 3.Valley Of Moon-San Juan, Argentina The Ischigualasto Formation, known as the Valley of the Moon, is a valley filled with strange clay formations --of all shapes and colors created by different layers of mineral and sediments. The strange rock formations have endearing nicknames, like the mushroom, the submarine and Alladin's lamp. The valley contains dinosaur fossils dating back as far as 225 million years ago, and in fact is the only place on earth where nearly all dinosaur fossils from the Triassic period can be found together. 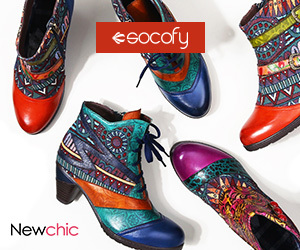 To visit, it is about a five hour drive from the provincial capital of San Juan City. 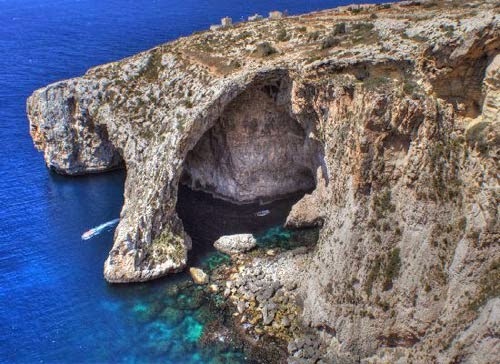 The Blue Grotto is a sea cave on the coast of the island of Capri made of limestone and the water within emanates a iridescent blue color similar in color to a sapphire blue topaz. This unusual light comes from another entrance to the cave, which reflects off the white floor of the water. But it also creates a magical environment said to have been used by emperors for bathing. It’s one the most famous of all Capri's tourist attractions. You can reach Capri by a 40 minute-hydrofoil ride from the port of Ischia or Forio, and from there book a boat tour. This massive sandstone plateau stretches across the borders of Venezuela, Brazil and Guyana. The impressive plateau is surrounded on all sides by 1300-ft. cliffs, creating an isolated and unique ecosystem. At the top are amazing rock formations have been carved by wind and water, and there are crystal beds that contain large, crystal formations. Stunning views from the top over the Gran Sabana of Venezuela, provides the best cloud cover lifts. 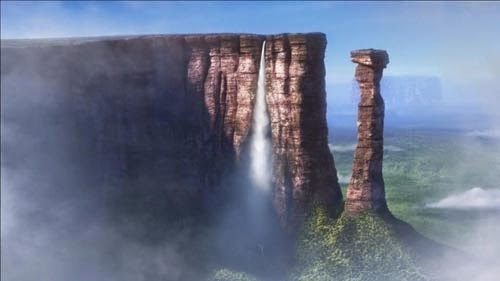 At the moment, visitors can only approach from the Venezuelan side, and the Paratepui Route is the easiest for non-technical climbers. Slot canyons are narrow and incredibly deep gorges (they can be less than three feet across yet well over 100 feet deep!) formed by water rushing through sandstone and limestone. Located in Arizona and Utah (among other places like Spain, Australia and France) their unique shapes have evolved through years of wear from water rushing through during the typical flash floods. 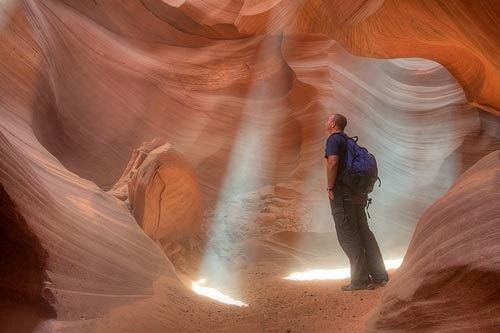 Antelope Canyon, located on Navajo Nation land, just outside Glen Canyon National Recreation Area is the most visited slot canyon in the Southwest. Grand Wash is another deep but easily accessed canyons along the scenic drive at the center of Capitol Reef National Park. Also known as “The Great Blue Hole,” the Belize Barrier Reef is one of largest barrier reefs in the world. It creates a natural ecosystem that includes atolls, several hundred sand cays, mangrove forests, coastal lagoons and estuaries. It’s so vast that much of it remains undiscovered and only 10 per cent of the marine life on this reef has been identified. Every year, over 260,000 tourists scuba dive in the Belize Barrier Reef, and the crystal clear and warm, protected waters make it ideal for snorkelers and novice divers. The Eye of the Sahara, or also known as the Richat Structure, is a mysterious and surreal landscape in the Sahara Desert. Located in Mauritania, the Eye of the Sahara is a huge circular formation, originally thought to be a crater. But the more recent and accepted theories suggest that it is in fact a product of erosion. At almost 25 miles in diameter, it can be seen from outer space and looks like a gigantic bulls eye. 9.The Ngorogoro Crater Tanzania-is breath-taking natural wonder -- a deep, volcanic crater that creates the largest unflooded and unbroken caldera in the world. About 13 miles across and nearly 2000 ft. deep, it was created when a huge volcano exploded 2-3 million years ago. Today it’s one of the best places to see Africa’s wild animals. Some 25,000 animals, including lions, rhino, leopards, elephant and buffalo –roam the area. As a result, there are a great many lodges around the crater where visitors can take to take in the animals in their natural habitat. 10.The Shilin Stone Forest China-Spread over 135 square miles in Yunnan province, the Shilin Forest looks like an ancient petrified forest filled with rock formations that jut vertically from the ground. Geologists say Shilin Stone Forest was formed 270 million years ago, when the constant movement of the earth caused the waters of the large sea, which covered the area, to retreat and allowed the limestone cliffs to rise. But locals legend says the Stone Forest was created by immortals that smashed an entire mountain to bits, to create a labyrinth where lovers could meet in total privacy.